If you had one too many last night, think twice before tying your running shoes. Spoiler alert: It’s not going to feel good. Some athletes swear by the sweat-through-the-misery technique. Like 800-metre US Olympian Nick Symmonds: “I find that exercise is the best recovery [for me],” he tells Runner’s World, adding that he’s spent many a track practice, especially in college, spewing sweat that smelled suspiciously of beer. He isn’t alone. Runners like to drink – science even says so. Last year, a study published in Frontiers in Psychiatry found that exercise and alcohol consumption were positively correlated. In essence, while athletes are less likely than their non-fit peers to engage in most unhealthy behaviours, such as doughnut-eating or smoking, they’re more likely to drink. Technically this is an example of correlation and not causation: running doesn’t make you drink, and drinking doesn’t make you run (unless someone dares you to streak), but scientists are puzzled by the seemingly counter-intuitive connection. One theory is that both running and alcohol stimulate the brain’s mesocorticolimbic pathway, an area that can grant a reward-like feeling to the body. It’s possible that those who like the feeling of busting through tough intervals are also more likely to crave the reward that a shot of whiskey gives – and both can be followed by a shot of pickle juice. This means you’re also more likely to end up with the occasional hangover. And we may be tempted to cure it with exercise. Unfortunately, like shouting “one more round,” sweating it out may not be the greatest idea. Alcohol acts as a diuretic. Early in the night (before the seriously regrettable stuff), your body pulls that water from your blood plasma. But as the night wears on, you dehydrate even more. At this point, your body will pull water from the brain to keep your other organs functioning properly. 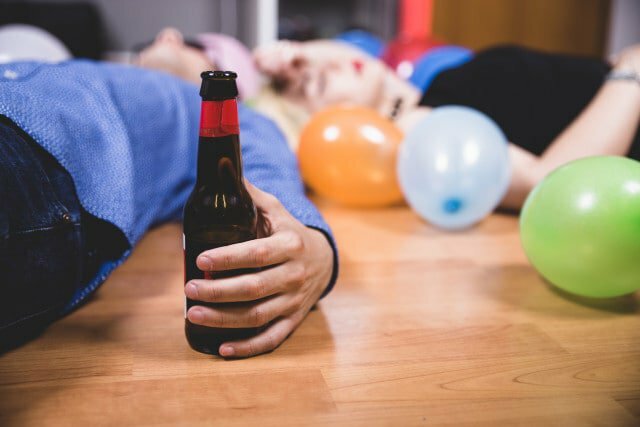 “When the brain doesn’t have enough water it stretches the [cell] membranes, which causes that hangover headache we are all familiar with,” says Damon Raskin, M.D., the chief medical officer for Cliffside Malibu, a drug and alcohol rehab center. So asking your body to go into a further liquid – and electrolyte – debt is not the best idea. Though, technically when you do smell tequila coming off your skin the next morning, it is (kind of) booze leaving your body. Still, because of the dangers of continued dehydration, he doesn’t recommend forcing booze out of your pores. So why do some of us feel better after pounding it out? First of all, because there is a range of genetic and physical factors that determine how we metabolise alcohol, people experience hangovers differently. This is why the friend who went shot-for-shot with you last night may be fine the next morning while you’re still in the foetal position. And for those lucky souls that metabolise alcohol relatively well, the hit of endorphins you get from an easy run may – at least temporarily – make you feel better, says Raskin. Symmonds, 32, also says that as he’s gotten older, he’s had to learn to be more careful – and now that he’s a pro, he rarely drinks to the point of misery. After all, while you may be able to survive a few kays, you certainly won’t be able to do the kind of workout that earns you a gold star in your training log. If you really can’t miss that run, there are a few ways to avoid getting sick or dehydrated. If you do drink, go with clear alcohols, like vodka or white wine, which contain fewer contaminates, but do it in moderation. “Anything in excess will undoubtedly create hangovers in most people,” says Raskin. Symmonds not only hydrates while he drinks but again before he hits the road the next morning. Alternate between alcohol and a glass of water to keep yourself well-hydrated. And before you lace up, drink a little more water, even adding some sports drink to help stock up on electrolytes. A 2010 study found that caffeine helped alleviate an ethanol-induced headache (to stimulate a hangover) in rats. What does that mean for people? It’s hard to know, but Martins agrees that for people who already drink caffeine, it won’t hurt. But, “Remember caffeine is a diuretic, and you should be aggressively hydrating,” he added. Martins also believes you should avoid caffeine at night. “The better quality sleep you’re able to obtain, the better you will feel in the morning,” he says.